Korea’s pojangmacha, or tented bars, have evolved over the years both in appearance and gastronomical offerings, now more polished and offering a wider array of dishes to go with drinks. But some distinctly Korean specialties, featuring odd ingredients unfamiliar to most foreign visitors and even many Koreans -- from chicken feet and cow innards to cartilage and squirming fish -- remain staple dishes at the tarp-covered watering holes. The food dishes, many of them doused in spicy sauces, are ordered with drinks, cutting through the bitter freshness of soju, Korea’s signature liquor, and beer. The following is a guide to some of the most unusual, and arguably tastiest, eats for the adventurous to enjoy when dining at Korea’s pojangmacha. Chicken gizzard -- the part of the chicken’s digestive tract connected to the stomach -- is firm, chewy and round. The muscular gizzard has an earthy flavor that goes best with salt and garlic. “The more you chew it, the better you can appreciate its unique scent and taste,” Joo Seon-tae, professor of animal science at Gyeongsang National University, writes in a book on meat. 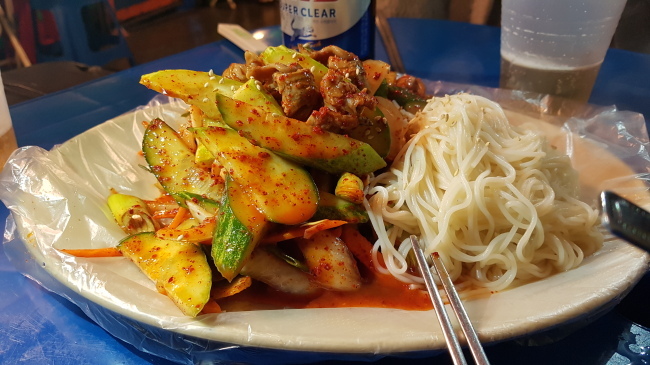 The dakddongjip dish was first offered as an affordable snack to accompany drinks and was favored by blue-collar laborers who gathered near Daegu’s Pyeonghwa Market in the 1970s, according to the Korea Tourism Organization. The southeastern city still has a street dedicated to the gizzard dish inside the Pyeonghwa Market. Dakddongjip is no longer the cheap platter it once was, selling at 15,000 won ($13.70) per plate at Yeouido’s Dangoljip, a popular pojangmacha where many office workers in the financial district gather for after-hours fun. 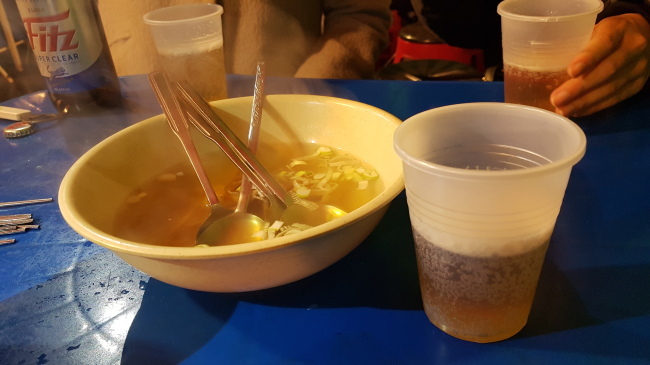 “None of the dishes served at pojangmacha -- especially ones located in the heart of Seoul -- are cheap anymore,” says Kim Sun-woo, who works in retail and frequents the tented eateries. With the talons wrenched out and cut off at the ankle, chicken feet have soft cartilage and collagen-filled skin, making for a chewy, slippery mouthful. Chicken feet are normally pan-fried with a heavy coat of spicy, chili powder-based sauce to mitigate its strong odor. Though the squeamish may find it hard to overcome the appearance of the claw-like feet, enthusiasts say the texture is unbeatable and the spicier, the better. Dakbal pairs well with seasoned rice balls covered in salty laver and sprinkled with sesame seeds to help tame the heat. Odolppyeo is made from the cartilage found at the tip of a pig’s ribs that are connected to the belly. It can be an odd experience to gnaw on the bone-like cartilage and soft meat that surrounds it, which emit an increasingly sweet flavor the more you chew. This part of the pork is also cooked in spicy sauce and stir-fried with vegetables. Unusual seafood dishes are also a pojangmacha favorite. Ggomjangeo -- though there are many terms for it depending on the region -- is the inshore hagfish, a type of eel-shaped, slime-producing fish also called “slime eel.” Korea and Japan are among the only countries where hagfish is commonly consumed. Ggomjangeo has a firm, springy texture and is usually stir-fried with vegetables and spicy sauce. “Ggom,” which suggests “squirmy” in Korean, comes from the fact that the fish continue to writhe and twist after it’s skinned, chopped and thrown on the grill. Sea snails, or whelks, makes for a humble snack that goes well with light, reasonably priced beer. Golbaengi is usually mixed with vegetables such as cucumber and onion and a sweet-and-spicy sauce containing a hint of vinegar, and served alongside boiled somyeon, or wheat noodles. 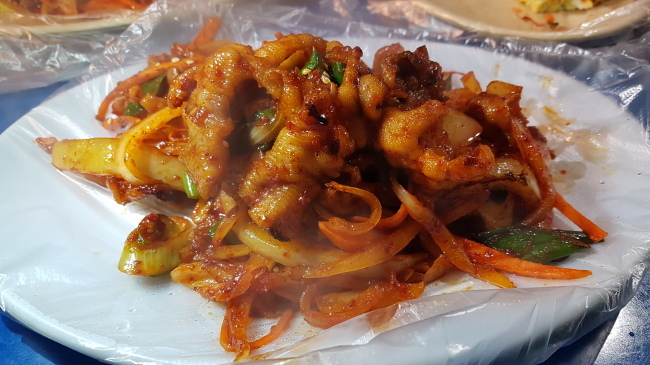 The dish is among the most popular, according to the owner of Hangookkwan, a Yeouido pojangmacha. “It’s the type of food anyone can eat. Everyone loves it,” she said. Low in calories, high in protein and bland enough to absorb spicy sauces, sea snails serve as a healthy side dish to drinks.